This is how the mini cluster looks like. 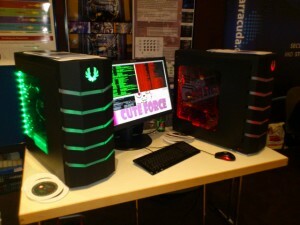 The University of Applied Sciences Upper Austria will be showing the Cuteforce Analyzer at DeepSec 2012. This beast is a massively parallel computing cluster for cryptographic applications. The goals of this project was to develop a cluster framework and to evaluate suitable hardware. The cluster itself utilises two different types of co-processors, namely the well-known graphics processing units (GPUs) also used in super-computing, and field-programmable gate arrays (FPGAs). Both types of processors have their strength and weaknesses, both depending on the algorithm being executed on the hardware. The cluster framework connects both hardware platforms, and assigns computing tasks according to the advantages of the co-processor. Thus you get to use all the advantages; in addition the framework software makes sure that you can use the different hardware processors as a whole. The research team will show you a PDF password recovery applications that brute-forces its way through the encryption algorithm. So if you have some encrypted PDFs and forgot the passwords, please bring them. We might help you recover your document. This entry was posted on November 13, 2012 at 01:50. You can follow any responses to this entry through the RSS 2.0 feed. Both comments and pings are currently closed. 2 Responses to "DeepSec 2012 Showcase: Cuteforce Analyzer"